I’m really excited to share my living room tour with you today. 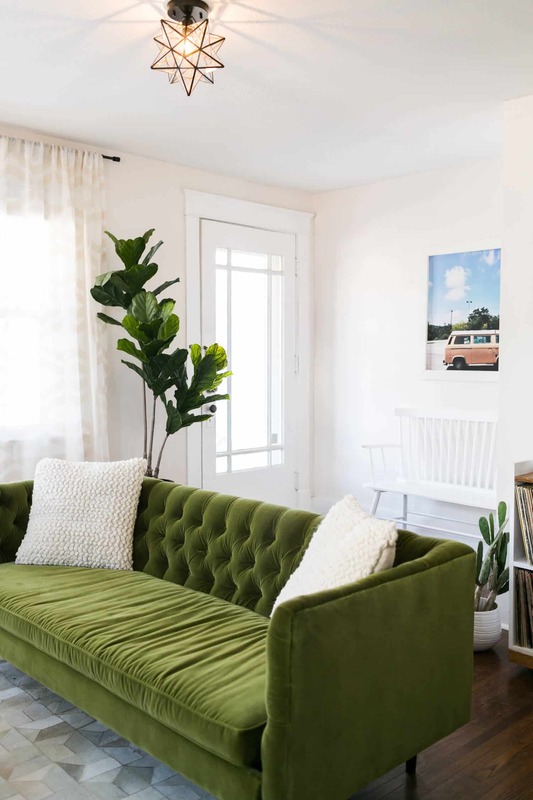 I had the best time designing this space, inspired by Nashville icons Johnny + June, with a ’70s color scheme inspired by “Rosemary’s Baby.” I had so much fun working with this color palette and the olive green velvet sofa was definitely my jumping off point for the rest of the room. But first, a walk down memory lane … Here’s what the room looked like BEFORE. It wasn’t bad by any means, it just needed a big refresh! The short, dark curtains were making our already not superrr tall ceilings feel even lower. 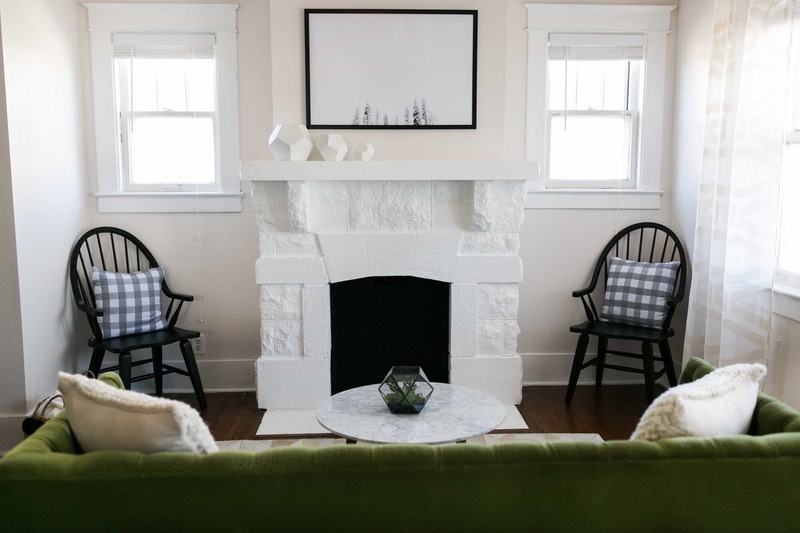 We love the vintage fireplace which is SO common in Nashville since a lot of homes were built around the same time (it’s almost a twin with Kacey’s fireplace), so we decided to give it a fresh coat of paint. And here’s what it looks like now! I’m really pleased with the outcome. We kept all of the original features intact, but upgraded them a bit … I actually think the new design is more true to the original style of the home, which was built in the 1930s. I did try to lean in that direction a bit when choosing finishes and furnishings. Here’s the entry, right by the front door. 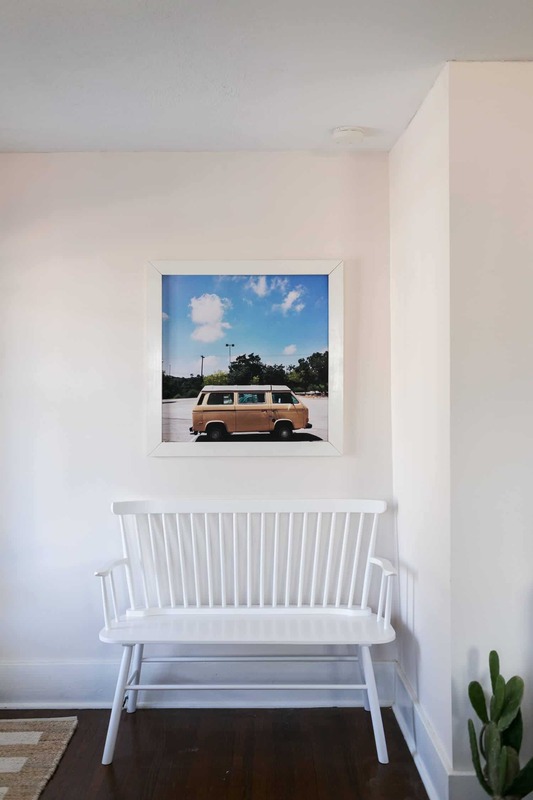 We added this white bench and oversized print from Etsy artist, Alison Holcomb. We made our own oversized frame using this DIY. I’m a big believer that you should make the most of your entry space even if it’s small … even if it’s pretty much non-existent, haha. 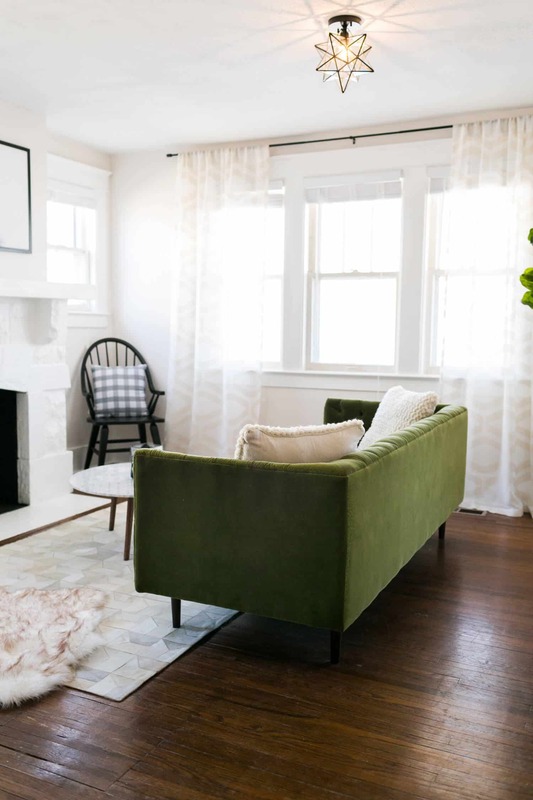 It’s the first impression of your home, so ANY cozy details you can add are a huge bonus. Here’s a pulled back view for context. We did keep the original door since it’s so pretty. And here’s the view if you had your back to the fireplace. Alright, let’s talk about this record station for a moment. I was able to collect ALL of these vintage records for $400 … which relative to the price of new records (at $15 to $30 each) is very inexpensive. It was probably the most fun task in this whole house. 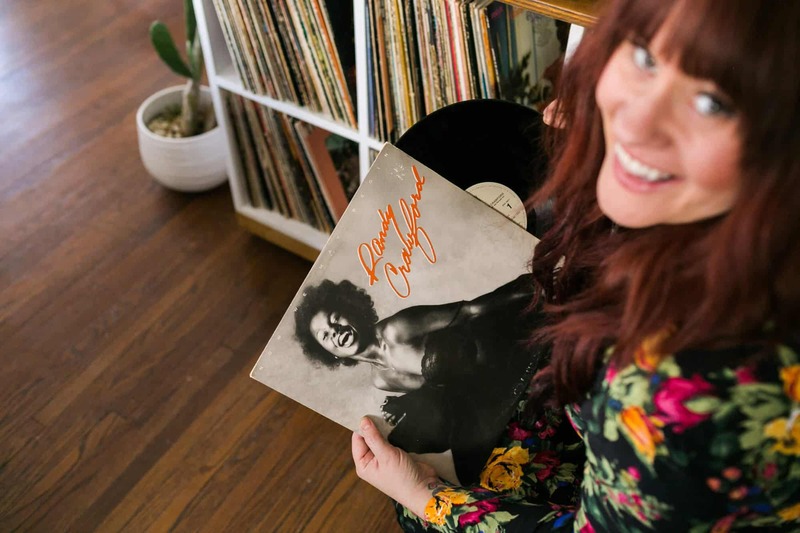 I love old records and I feel like it brings so much personality to the space to fill it with old music! 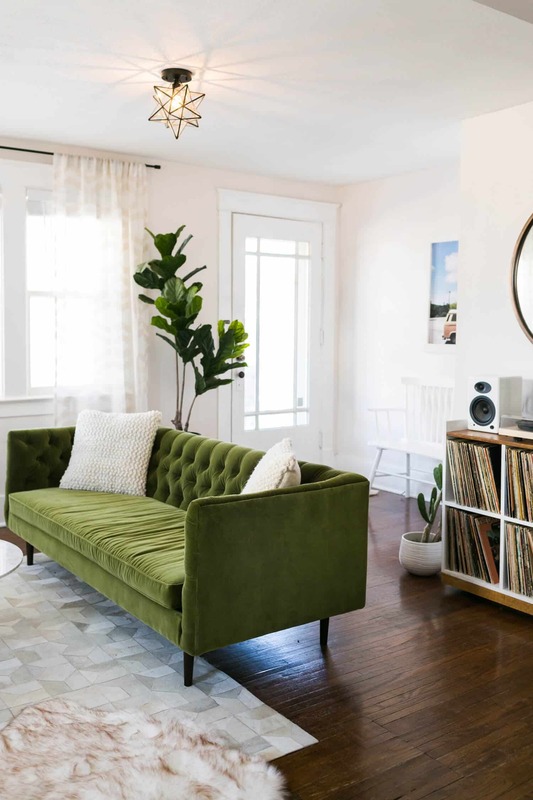 The record player is a real beauty from Wayfair and the speakers are from Audioengine. The oversized mirror is gorgeous and it’s on sale now. 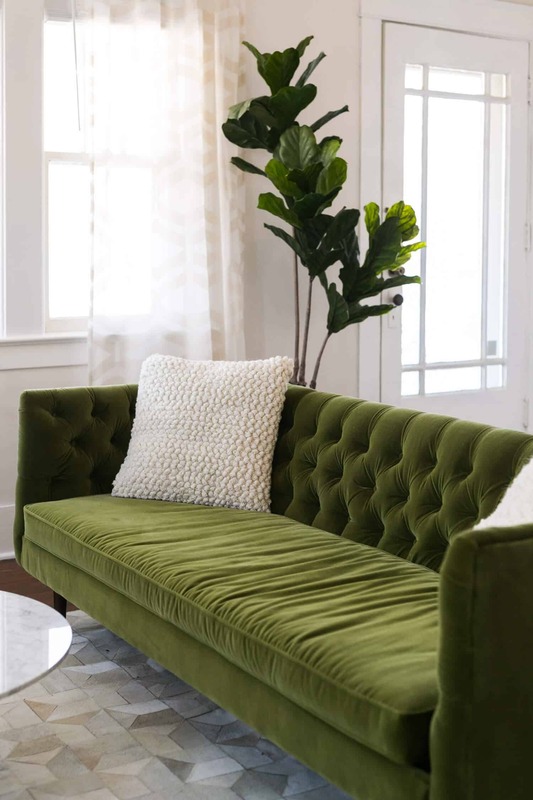 Let’s talk about the green sofa for a moment. I get SO many DMs and emails about Article sofas … I think it’s because their prices are so affordable. I LOVE this sofa. It’s so functional for a high traffic space. The fabric is forgiving and the color will hide small signs of wear that happen over time. I am having a SERIOUS obsession with olive green right now too … like it might be my favorite color. 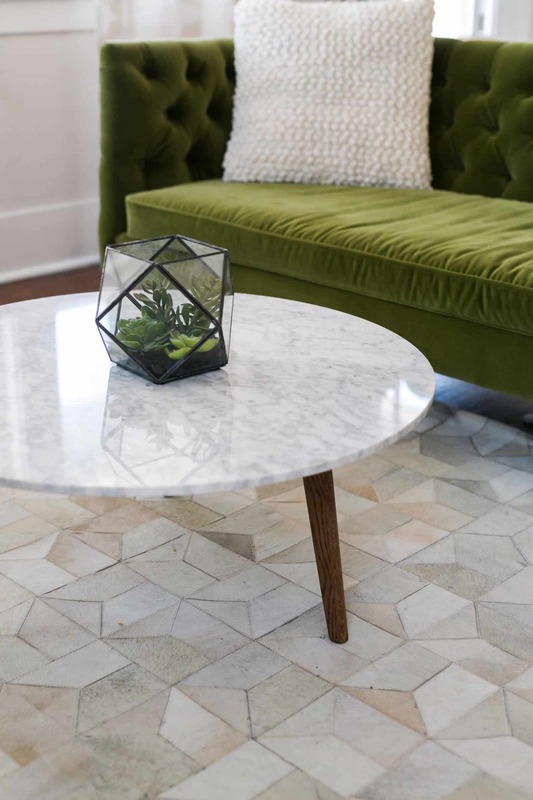 Our coffee table is also from Article and it’s real marble. It’s so pretty and classic and simple. I love it! The rug is quilted cowhide … a lot of people mistake it for tile in photos, which is kind of funny. I chose this material because it’s super durable and easy to clean. It was a happy accident that it kind of looks like the tile we chose for the kitchen. 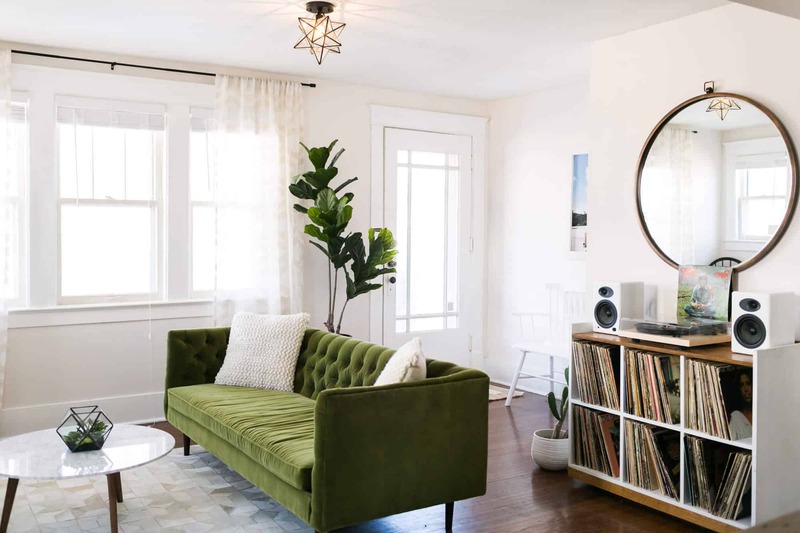 Sources: Olive Green Sofa/Article, Marble Coffee Table/Article, White Bench/Wayfair, Bus print/Alison Holcomb on Etsy, Star light fixture/Amazon, Turntable/Wayfair, Speakers/Audioengine, Circle mirror/Wayfair, Coffee Table/Article, Rug/Wayfair, Wool Throw Pillow/Wayfair, Art Print/Max Wanger Print Shop, Gingham Pillow/Wayfair, Curtains/West Elm. 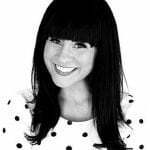 Here’s a link to our Airbnb listing. In addition, you can book directly through the the local small business who manages our bnb, Epicbnb (and save on a few fees). Credits/Author: Elsie Larson. Project Assistant: Collin DuPree. 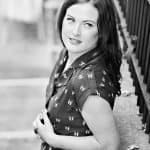 Photography: Amber Ulmer. Photos edited with A Color Story Desktop. 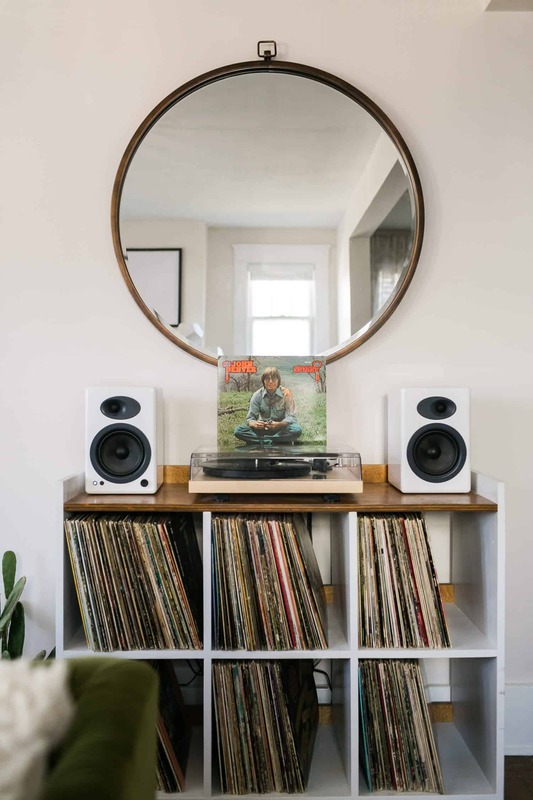 The record player stand/shelf is awesome – was it a diy? Or do you have a source? I second that! I’ve been looking for a record cabinet forever and this one is lovely. Any chance you might recreate it for a post? It’s a great piece. This is a beautiful room! I love that start light and have been looking at one for my laundry room. Does it put out a lot of light? Can you use it as the main light source in a room? I’m sold — buying an Article couch for my next space! Thanks for sharing! I love this room. I have a green couch as well! I love that it can function as a pop of color without stealing the show from the art and other details. I’ll be bookmarking this airbnb for sure! Elsie, what are your thoughts on ceiling fans, especially since you’ve spent a few years in the South? We’re renovating our house in Alabama and are considering putting a (simple, modern) fan in each bedroom and in the living room. But I’ll miss the opportunity to use fun fixtures, like this star one! I never thought I’d see a room inspired by Rosemary’s Baby, but it’s really cute! Nice job. Yeah- I am obsessed with their apartment in the movie. It’s so pretty! That sofa is just perfect. Love it! What a beautiful and welcoming space for your guests! I would love to know the source of your black lights that are visible in the mirror reflection in one of the photos. 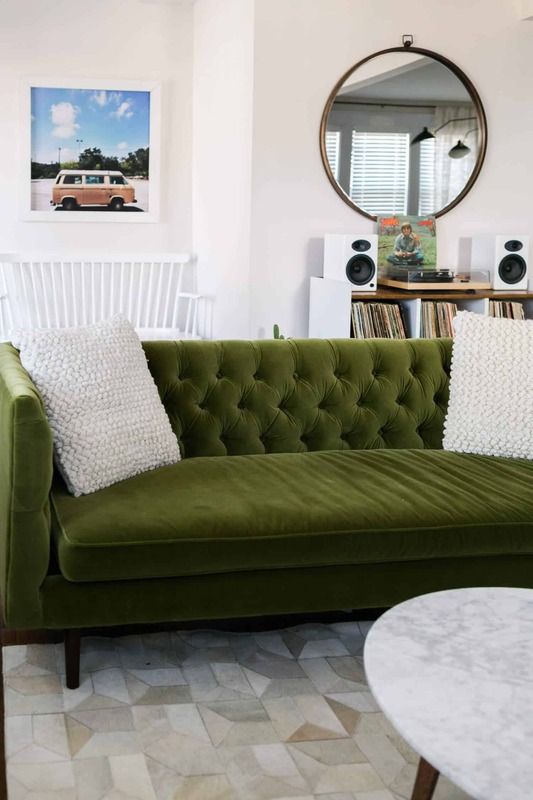 That green couch looks incredible, what an eye-catcher! 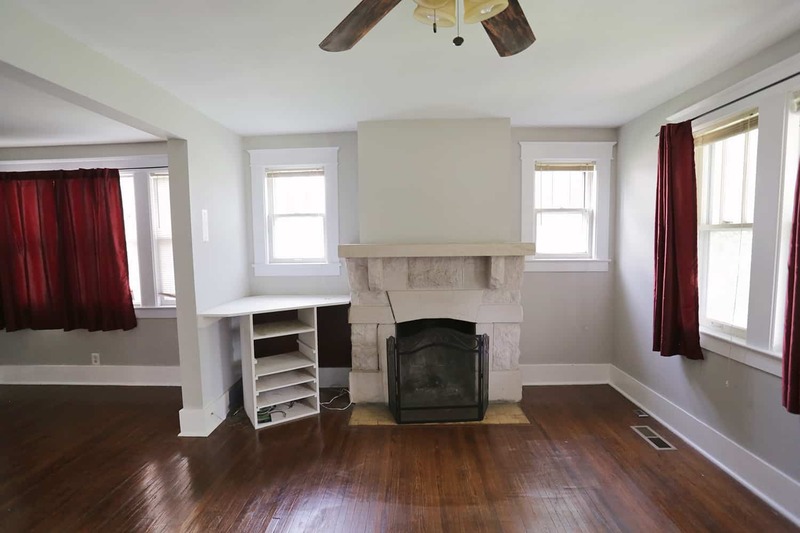 My first thought when seeing the updated fireplace was that the mantle should be green to match the sofa! I love the room, looks beautiful! This is so fun and I LOVE that sofa! Where did you buy the curtains? Love them! Where are the sheer window curtains from? Moving into a new space and am in the market for subtle patterned sheer white curtains – love these, would love to be able to purchase! Love the overall vibe and arrangement of the room!! love the color palette! that couch is gorgeous. the records are such a fun nice touch! 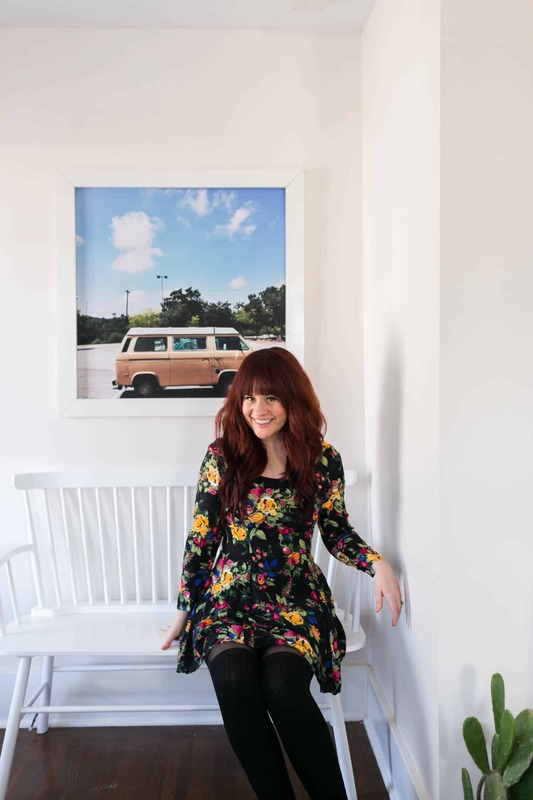 Hey Elsie – I loved following your airbnb journey, and you’ve created such an awesome space! How are you finding the air bnb process now that you’ve been up and running for a while? Is there anything you’d do differently?